All the spring stuff is coming out, which a) makes me so sad that it's NOT spring yet, but b) makes me want to shop and get the new, fresh fashions. You can also see this dress on Gigi. 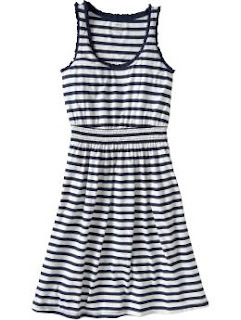 I love this cute dress for the summer, but I can't really justifying getting anything now that I can't actually wear... so how could I wear this now?! Layer on a floral cardi over the dress, hike on some tights and a pair of boots or fun closed toe, suede pumps, wrap around a scarf, and I'd say this is worthy for winter, right? Jazz up the casual stripped sundress with some fun sandals and statement necklace, with dazzling studs.